How hard can it be? I thought. I learned to play the ukulele in one weekend. I learned to play the guitar at 13… These are both terrifically fun instruments that offer almost instantaneous rewards. You pick ’em up, learn a few chords and pretty soon you’re strumming songs – at least well enough to accompany a roomful of drunken people who think they are singing. Sure it might take years of practice (and considerable innate musical talent) to really explore the full potential of the instrument, but in the meantime your friends will not feel assaulted by your efforts, they might even enjoy listening to you, at least for brief periods. Not so for the fiddle, I’m afraid – four months into the effort I have barely managed to get to the stage where my cat no longer howls and scratches at the door, desperately trying to escape my practice sessions. Now she just slinks into the next room and cowers under the bed for the duration. My family has stopped asking me to play for them – actually that stopped after about the first month… and I know that the torture I have put them through so far is beyond inhumane. My dear sister-in-law comically describes fiddle practice as a “screeching, howling banshee-noise” in her blog, and the minute I open the violin case, my husband pulls on his headphones and fires up the MP3 player full blast. It’s a good thing we live in the country, or my neighbours would have sought court injunctions by now. And my fiddle teacher? Well, as far as I am concerned, fiddle teachers are more brave and selfless than flight instructors – I cannot even begin to describe the horrors they have to put up with on a daily basis. How do you hold the @$%&@ bow? Only the tip of the thumb touching the bow? YES! How tight do you tighten the bow? I hate to admit it – but the right answer was indeed “tight enough”. Or, to be more precise, it was “just experiment with it”. So far, I would say to err on the loose side is better than having it too tight. A good rule of thumb I read somewhere on the web is to just have room to fit a pencil between the stick and the hairs at the centre of the bow. I have actually, occasionally, made semi-musical sounds come out of the fiddle with this setup; it helps to take the pencil out first though. 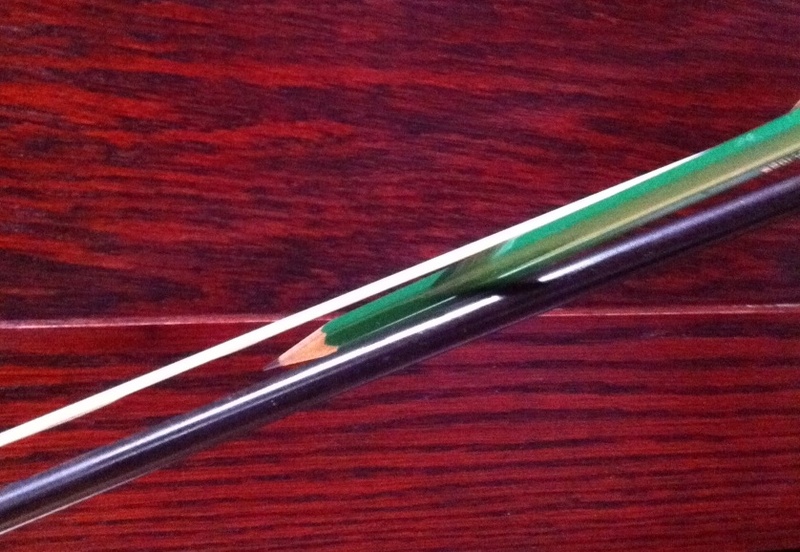 How much rosin are you supposed to put on the bow? Before I started this adventure I thought that this would be the main problem – and now that I have graduated to such high-class worries, I’ve found it is definitely the worst one yet. As a guitar and ukulele player, I wondered how the heck I was supposed to know where to put my fingers on the fiddle, with no frets to guide me. Like most beginners, I started with the fake frets – little bits of tape positioned to mark the locations of certain notes. However, they’re sort of like the training wheels you had on your first 2-wheeler bike as a kid – having them on there makes you feel like a baby and you just can’t wait to get them off! I found they helped a lot at first for general finger positioning, but the tapes are about a half centimeter wide and I found that a mere millimeter either way can make a huge difference in the pitch of the note I am playing. So I got frustrated again pretty quickly and took them off, then I put them back on, then I took them off again. Two months into the learning process I took them off for good. I just read somewhere today that you should try not to use them past about 6 to 9 months! So maybe I gave up on them too early. Maybe I would have progressed faster if I’d left them on. Anyway, I have been working without them for the past two months and I have tried a couple of alternatives with varying success. First I tried a chromatic tuner. Basically, it’s a gadget that displays the note you are playing – so you can move your finger up and down the fret board until you find the note you want to play. It worked well for finding the notes on the E and A strings (the two thinnest strings) but not for the dreaded D string. I have spent the past 6 weeks on the D string. All I can say is that it’s a good thing I bought an expensive fiddle because otherwise I would have given up by now, or even worse, I would have smashed it into a million bits! One millimeter, one frigging millimeter, is the distance between playing F# too sharp and playing it too flat. I was convinced that the actual F# note didn’t exist on my fiddle’s D string… and you can’t find what isn’t there, right? The second thing I have tried is playing along with recordings of the notes, first in easy songs and now, lately, with recordings of the scales that my teacher has made for me. This is, by far, the best approach. I feel almost like I am learning exponentially now. Okay, at least I am finally making some incremental progress. The other thing that has helped is to focus on playing along with very slow songs only. It’s just too hard to be accurate when your fingers are racing around the finger board. 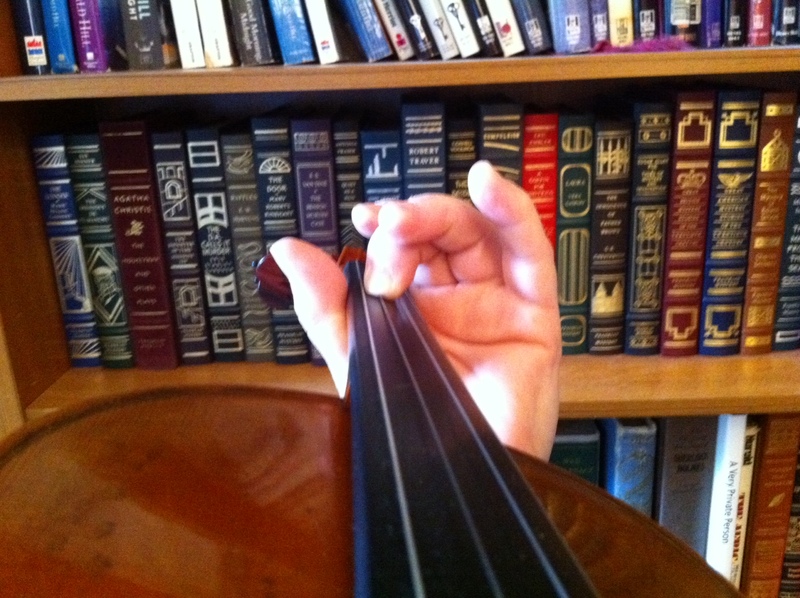 This entry was posted in Fiddlin' Around and tagged Fiddle, humor, Music, violin. Bookmark the permalink. This is a great post–and thanks so much (I think) for mentioning my blog in it. I can hardly wait to hear you play the fiddle the next time we get together…I am sure that I will be suitably impressed! Keep at it….and what do you mean, you learned to play the ukulele in one weekend? Then how come it’s taking me so long to learn the darn thing? I’ve been working on learning to play the ukulele lately. I know 4 chords now, but my strumming is awful and I’m slow at changing from chord to chord. So your statement about learning it one weekend makes me amazed. I wouldn’t mind have some of that music mojo you’ve got. He he – thanks for reading my blog, Virginia – and for commenting! Don’t get discouraged with your progress to date – I only learned to play the uke quickly because I had already been playing the guitar for about 40 years. 🙂 Plus I employed a few tricks which I’ll be posting in an upcoming blog – hope you get a chance to come back and check that out.